We’ve been tracking with this theme for a 3 weeks, and I’m sure someone has thought or said this to themselves during our conversations, “But I don’t even like my neighbours…I don’t like my neighbourhood…I wish I didn’t live with these people”. As we finish up our series, we look at a place in scripture where Israel was displaced and living in a place they wish they didn’t. They felt homeless and out of place, not fitting in with their new surroundings. We find ourselves in Jeremiah 29…Israel is in Exile. They’ve been brought to Babylon by another king, and of course don’t like it one bit. God tells them that there is a purpose in this; that he can use them there, but of course this is hard to take or listen to. Here are words to people who don’t like their new neighbours, who are unsettled, who don’t fit in, and wish they were somewhere else. Wish for your neighbour what you wish for yourself. If they prosper, you prosper. Later we read, “I know the plans I have for you…your welfare, your future, your hope. As we pray that for others, know that God is planning that for us. Finally, God says, pray & call on me. Seek me and you will find me…I will be found by you. This is a story about people who are sent to live with neighbours they don’t want to live with. They’re struggling with how to live their faith in the midst of a culture that doesn’t acknowledge GOD as their God. What does God tell them/us to do? Pray to me…seek me…I’ll be right their with you the whole time. 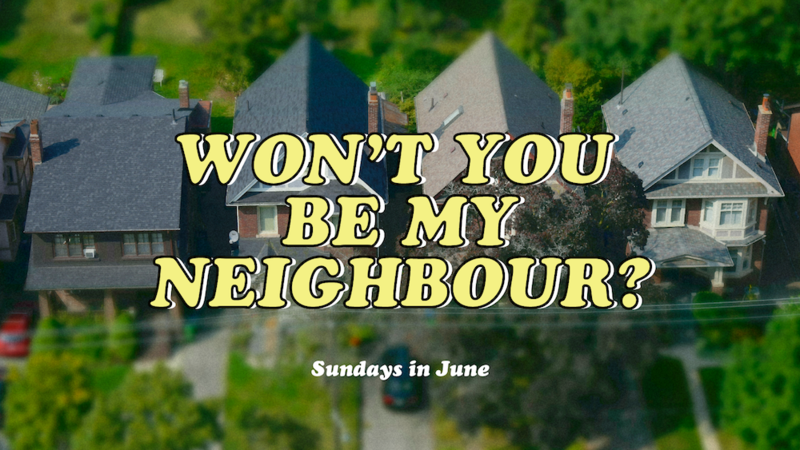 So, we want to end our series, won’t you be my neighbour? with some prayer and some homework. – Ask God to use you to speak encouragement to your closest neighbours (family/friends). – Walk across the street…more than you currently do.